The ECA executive committee awarded 13 travel grant to young researchers to attend the ECM31 meeting in Oviedo, Spain, from 22 to 27 august 2018. Their travel reports follow alphabetically on this page. I would like to thank the organizing committee for the great opportunity to share my recent results by presenting a talk at microsymposium of the ECM31 conference. Attending the ECM31 and the symposium MS14 “Combined approaches for structure characterization of modulated and complex structures” is one of my highly active participation for this, as I presented my research (in a presentation entitled “Nanocluster model and its application for crystal structure prediction of complex structures”), which is based on the development of new methodologies for structural description. Intermetallic compounds have important industrial and technical applications, however, their synthesis and structural characterization can be rather complicated. One of the important thing to know about intermetallics is what they consist of and how building units connection is related to their structure and properties. Based on this knowledge the structure prediction process can be organized in much more effective way. An automatic procedure of representation of crystal structures as assembling of primary nanoclusters was developed and implemented into the ToposPro program package. This approach is especially efficient to elucidate complex intermetallic structures. For generating models of new crystal structures the collection of Topological Types of Nanoclusters (TTN) was created. Worth noting that in this work theoretical and experimental studies were successfully combined. We have demonstrated that nanocluster model coupled with disordering modelling can be useful for new structures discovery, and, in collaboration with our colleagues from Universities of Genova and Milan, we have synthesized three new intermetallics in well-known systems. I would like thank you for considering the application for the Travel Grant which is one of the reasons that enable me to attend this prestigious crystallographic meeting that held from 22 to 27 August 2018 in Oviedo, Spain. I have arrived at ECM31 with my first resolved protein structure which I have deposited in PDB just five days before the conference. I was impressed to meet here senior crystallographers who are my role models for my future research career. I am happy to know young PhD students who are working with similar methods just as I do and they are facing with similar difficulties throughout crystallization and structure refinement. I made new contacts and friendships and I feel really happy about that. It was also useful to meet the representatives of crystallography-related companies. 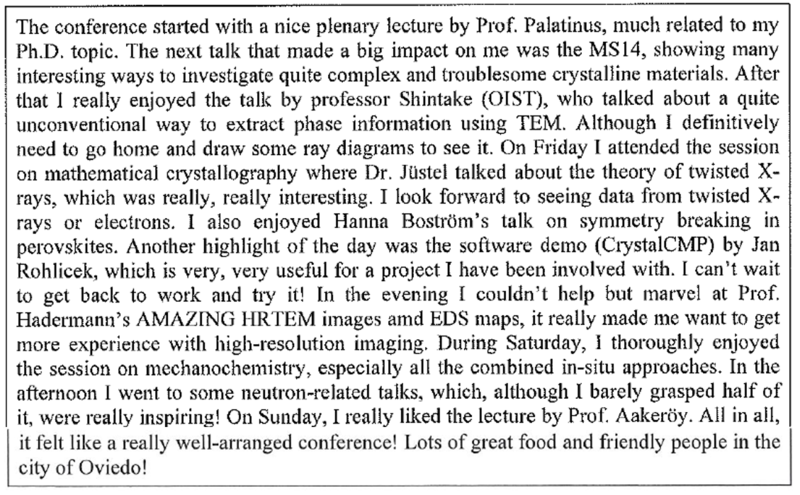 I was pleased to hear about data collection techniques I have not used before, for instance about electron crystallography and time-resolved serial femtosecond crystallography. I find free electron lasers really interesting and I hope to learn more about them and to use them for data collection in my future. It was also pretty useful to hear a lecture about the advantages and disadvantages of different biophysical methods for analyzing protein quality. I agreed with the chairman that if I had to choose just one method for protein quality assessment that would be gel filtration because of its simplicity and reliability, though I would not miss a chance to assess my sample’s homogeneity using dynamic light scattering before setting up my crystallization tray. It was really interesting to talk to Mia Rudolph who is growing and investigating protein crystals in living insect cells, where the gene of interest is introduced into the cells by baculoviruses. Besides biochemistry I was always interested in renewable energy sources and green energy, therefore I grabbed the opportunity to listen to professor Yaroslav Filinchuk’s keynote lecture about hydrogen storage in the form of complex and chemical hydrides. I am impressed by the prospective option of using all-solid-state batteries. I particularly like the atmosphere of European Crystallographic Meeting and I also plan to visit this conference in the upcoming years. For me, the ECM31 was a great success. The conference itself was well organized and the place of the conference was truly unique. We had enough time for the poster session and for talking to people at the booths. I attended symposia connected with programming, calculations and small molecules crystallography. Apart from purely crystallographical knowledge, I gained a lot of confidence in pursuing a path that required more knowledge about programming. I never had any proper and official education in this field, all my knowledge is self-taught, but I noticed that a vast majority of authors of crystallographic programs started the same way and learned everything on their own. It’s truly encouraging to see that you don’t have to be an expert to begin your work. I especially liked the MS41, as the speakers shared their personal experience with making and publishing their own programs. In my opinion this is a very valuable knowledge that can’t really be obtained in any other way than by speaking with someone who experienced this on their own. Maybe some of the conclusions would be quite obvious to a programmer, but for me they were new. easy, as the subject has to be presented in understandable way, and if possible – entertaining as well. This year I was able to attend the 31th European Crystallographer Meeting in Oviedo, thanks to the support by the ECA travel grant. Coming from a small group in structural biology at the University of Graz, Austria, I have never attended such a huge conference of crystallographers before. I just recently started to work in protein crystallography by writing my master thesis about S-layer proteins of Lactobacilli. Therefore I was deeply impressed by not only the different applications of crystallography, but also the leading experts and scientists from all over Europe and the world. This yearly meeting is a great opportunity for them to share their knowledge and thereby help the crystallographer society to evolve. But not only crystallography, also the accompanying methods to analyse the obtained information or gaining new additional insights were provided at this conference. I especially want to highlight the strong participation of women this year. Female scientists could be found throughout the chairs, plenary speakers, talks of the microsymposia and posters. I also got a talk at the microsymposium of “Biophysical characterization and crystallization” and presented my work at the Young Crystallographers Satellite meeting. 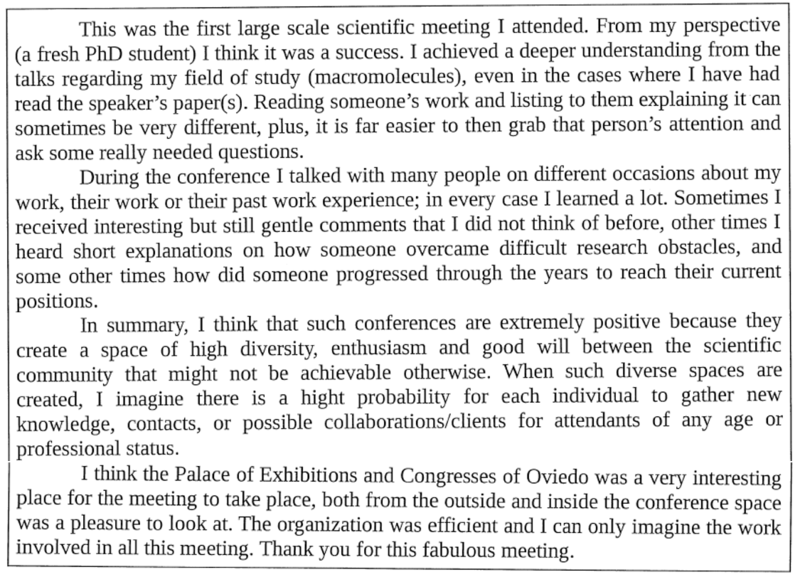 This meeting and events like the young crystallographer mixer promoted the networking of the next generation of crystallographers and paved the way to future collaborations, interdisciplinary networks and friendships. Another beautiful example of the exceptional execution this year was the strong integration of family life into the conference. With an onsite childcare service and a kids room in the same building, families could also enjoy attending the conference. It was a great experience to see children running around the exhibition hall and benefitting from the various sweets offered by the exhibitors. The whole conference thereby developed a less serious and more familial feeling. Thanks to the ECA and ECM31 I am convinced that the crystallographer society is getting stronger and better connected every day. I am deeply grateful for the support I received by the ECA and am looking forward to the next meeting in my country of origin, Austria. The experience at the 31st European Crystallographic Meeting at the Spanish north coast in Oviedo was a great experience. I really enjoyed the atmosphere in which new bonds are formed for future correspondence, collaborations or exchange of experiences, and already established bonds are maintained and extended. Interesting, lively and sometimes very passionate discussions during the breaks and poster sessions nourish the network and the international links of this great community that meets regularly in Europe and the world. The scientific program was very dense, and I often wanted to listen to two different presentations at the same time. I was often told by others that I had just missed an amazing talk. There were several presentations that were very inspiring for me. Among other I want to mention the plenary talk on the age of electron, the keynotes on quantum crystallography and challenges with polycrystalline materials, and the sessions on education in crystallography, energy saving materials, mathematical crystallography and many more. This overview gives a small insight into the broad range of topics that were offered at the meeting. I want to congratulate the organizers for the successful event that they made happen. A lot of effort on shaping a well-balanced conference with barriers reduced to a minimum has set new standards for future conferences. On every crystallography meeting I somehow have the feeling that it is another family meeting and we will meet again soon to talk about our adventures and advances in the laboratory. I am glad that the ECA supports young scientists like me. 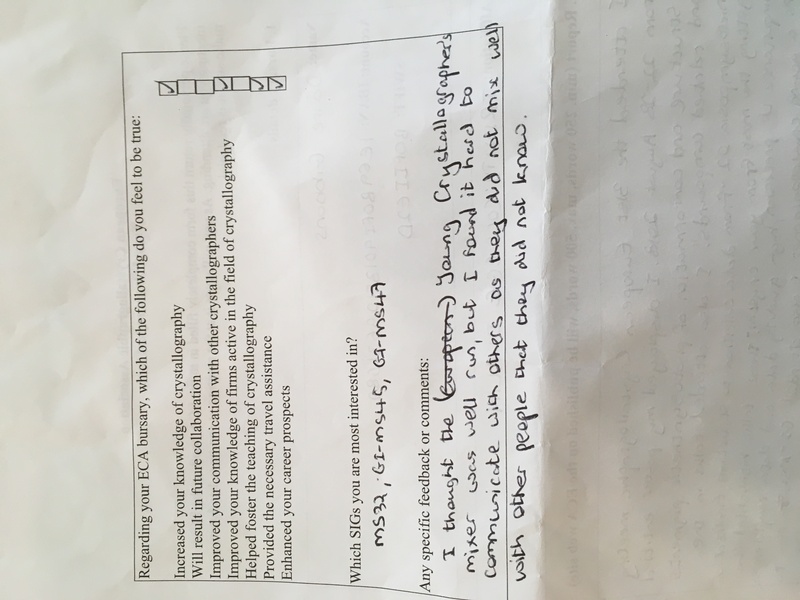 Apart from that I especially appreciate the overall effort of the ECA for the crystallographic community, which makes conferences like the ECM to what they are: diverse, international, inspiring and at the cutting edge of science. Whilst sitting in the main exhibition area of the conference venue, it has been good to reflect on the past few days at ECM31. Oviedo has been a wonderful host city with its stunning countryside surroundings, friendly people and great cuisine. We were treated to a very warm welcome by the speakers at the Opening Ceremony, including the ECM31 chair Prof. Santiago García Granda and the Mayor of Oviedo Wenceslao López, as well as being treated to a performance by the Real Banda de Gaitas (which, as someone from a fellow Celtic region, I appreciated a lot!). Attending ECM31 was a fantastic opportunity to experience contributions from, and connect with, participants representing the countries within the ECA and beyond. The work presented covered a wide variety of topics on the past, present and future of the field in crystallography and its application alongside many complementary techniques. Despite the topic of these two talks being firmly beyond my day-to-day experience with crystallography, the plenary lecture by Lukáš Palatinus and the keynote lecture by Joke Hadermann were definitely two of highlights of the conference for me; the former focused on the development of electron microscopy/diffraction techniques and contemplated their role in the field of crystallography as a whole (as he asked with his lecture title: is the 21st century the age of the electron?) while the latter provided more detailed examples of utilising a range of electron microscopy and spectroscopy techniques to study perovskite-type materials. 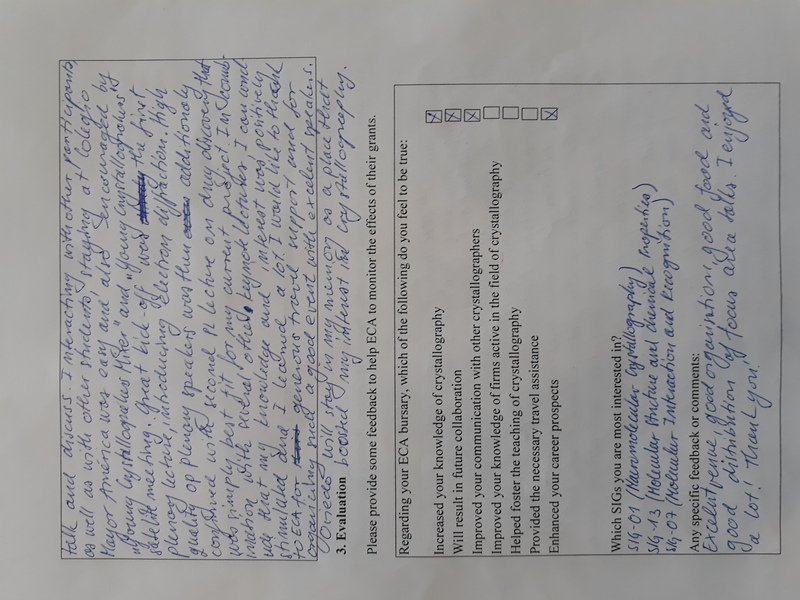 As well as being able to attend the microsymposia dedicated to presentations on the study of functional materials, which is my area of interest, it was also enjoyable to attend the microsymposia concerning the career possibilities (or “next steps”) in crystallography. This was incredibly well-attended, highlighting the interest from a wide range of participants, from perhaps occasional crystallographers to the incredibly experienced, to hear and learn from the speakers’ journeys within the field and career paths. Amongst all the technical scientific presentation, being able to also experience the more “human” side of the people working within crystallography has been, in my opinion, the most eye-opening part of this experience. I must express my grateful thanks to the ECA for the reward of the travel grant. 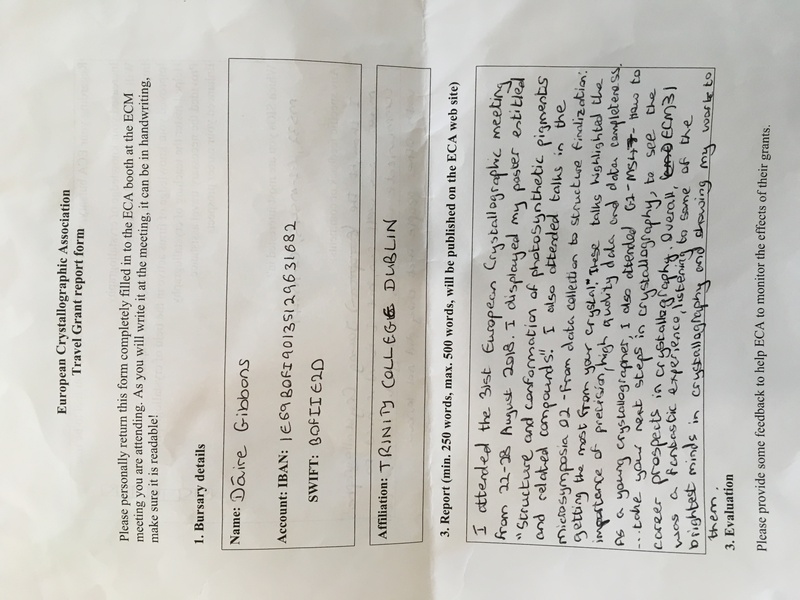 It has provided me not only with an outstanding opportunity to present my work at the ECM31 conference, providing a small contribution to the overall conference programme, but also to be able to feel part of the international crystallographic community, and I’ll leave Oviedo with experiences, memories and connections which will be invaluable. This year, I was present to ECM-31 conference in Oviedo (Spain) thanks to a travel grant from ECA I thank for that. This conference was the opportunity for me to present a part of my PhD work in an international crystallography congress. I had an oral presentation in the MS18 session about in situ investigation of crystals and polycrystals of Spin-Crossover materials, under pressure. This congress was very friendly, facilitating the discussion. The research areas and sessions were numerous and varied. The planning of the parallel sessions was well conceived even if sometimes I was interested in two or three parallel sessions. Indeed, this congress represents an opportunity to open our mind to other research areas and topics. I really appreciate to attend to microsymposia as “Crystallography in Earth and space” or the ones in physics about quasicrystals and magnetic order. More generally, this conference reflects the interdisciplinarity of crystallography and I think it’s the most important thing. Another essential aspect for me was the session “Women in crystallography”. A lot of work remains to be done to improve the condition of women in crystallography and in science in general. This kind of session, in international conference as ECM-31, is a first step to inform the scientific community. 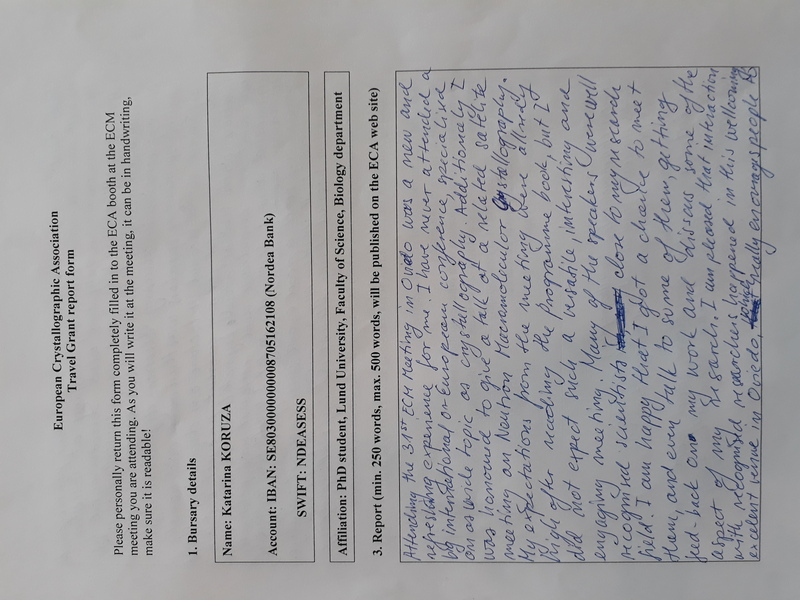 Finally, ECM-31 was, for me, the opportunity to extend my network and to connect with worldwide crystallographers. This congress was a real pleasure, in a very pleasant city, with a culture of its own and I want to thank the people in charge for the organization. ECM31 gave me a precious opportunity to talk to excellent crystallographers from all over the world. Ideas were exchanged, results were discussed, and future career opportunities could also be developed from here. I work in the specific field of electron crystallography, and ECM has always been the spot where all electron crystallographers come and talk about the frontiers of their own work. This is very essential for me to get the idea about how the field has developed over the past year, and what the current problems are. As an electron crystallographer, it is always useful to talk to x-ray crystallographers and get some idea from them, and ECM is the right place to meet them. In addition, I also went to the crystallographic computing forum right before ECM in Mieres, Spain, and there I had the chance to talk to all the participants in the field of method and software development in crystallography. As a PhD student working in this particular field, talking to them gave me a lot of inspiration for my own work, as well as the detailed implementations in terms of software and algorithm development. I also had the privilege this time to serve as one of the juries for Nanomegas electron crystallography poster prize. The unique experience of serving as a jury made me aware of how the prizes were awarded, and this is very useful for me in terms of future presenting of my own work, especially in poster form. Last but not least, a taste of northern Spanish culture (and also food) has also been quite fun.